For paper, fiber and decorative arts. 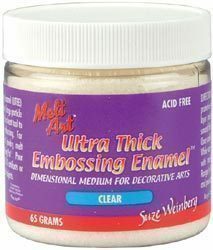 Ultra Thick Embossing Enamel™ (UTEE) is a specially formulated, large particle embossing powder. Use a heat tool to produce textured embossing. For one-of-a-kind art and jewelry, melt UTEE in Ranger’s Melting Pot®. Pour into molds to create 3-D artifacts or dip to coat a variety of objects.